Mountain Side rents premium, made in the USA Crescent Moon Snowshoes. Made in Boulder, CO, Crescent Moon Snowshoes are some of the best snowshoes available to rent anywhere. Mountain Side rents snowshoes by the day, weekend, week or longer. Rentals are available in-store only. Recommended for snowshoers up to 195lbs. Fits shoe sizes 5 to 10 and people up to 195 pounds. You’ll feel the support of these showshoes in every direction of movement – whether it’s uphill, downhill, traversing terrain, walking, or even running. The bindings are incredibly easy and fast to get into, and out of, but best when they’re on. Fits men’s shoe sizes 10-15 and larger backcountry boots. The Gold 10 is built for unending exploration, where most trails end and the fun begins. Bigger bindings, more traction, more surface area, the Backcountry model is built for adventure. The Gold 13 Trail is for women up to 165lbs and foot sizes less than 12. Ideal snowshoes for larger kids and teens as well. Lightweight, easy to maneuver and feature a frame bent with a steep nose and tapered tail, these shoes have a unique teardrop shape to help you maintain your natural stride. The three stainless-steel crampons include a toe claw for climbing. 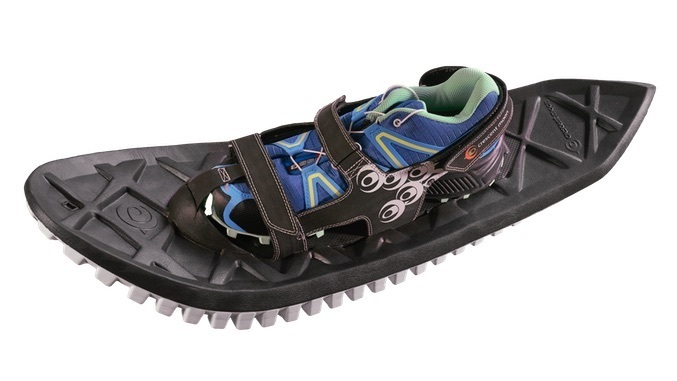 Best for snowshoers under 200lbs and fits shoe sizes from 7W to 14M. This is no ordinary snowshoe. Racking up awards and accolades as “Best in Show” at the Outdoor Retailer 2017, listed as one of the “41 products changing the way we live” by Men’s Journal Magazine…never has a snowshoe received this much press.